(Book). Many of the architects of rock and roll in the 1950s, including Elvis Presley, Jerry Lee Lewis, and Little Richard, were Southerners who were rooted in the distinctive regional traditions of country, blues, and R&B. As the impact of the British Invasion and the psychedelic era faded at the end of the following decade, such performers as Bob Dylan and the Band returned to the simplicity of American roots music, paving the way for Southern groups to reclaim their region's rock-and-roll heritage. Embracing both Southern musical traditions and a long-haired countercultural aesthetic, such artists as the Allman Brothers Band and Lynyrd Skynyrd forged a new musical community that Charlie Daniels called "a genre of people more than a genre of music." Focusing primarily on the music's golden age of the 1970s, Southbound profiles the musicians, producers, record labels, and movers and shakers that defined Southern rock, including the Allmans, Skynyrd, the Marshall Tucker Band, Wet Willie, the Charlie Daniels Band, Elvin Bishop, the Outlaws, the Atlanta Rhythm Section, .38 Special, ZZ Top, and many others. From the rise and fall of the mighty Capricorn Records to the music's role in helping Jimmy Carter win the White House and to its continuing legacy and influence, this is the story of Southern rock. 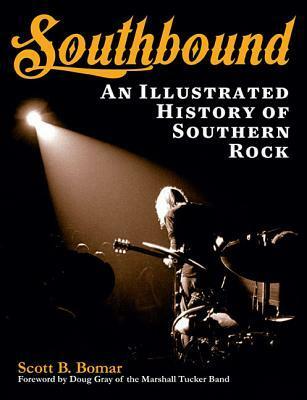 I first thought that this book Southbound, was going to be about only southern rock music and the groups that are associated with that music. I was wrong. The first few chapters takes you through a quick history of music in the South. Through the independent labels and the singers and musicians that came from that region. You find out about blues players, country western singers, and then the begging’s of Rock and Roll. How early on some blues players like Muddy Waters, for example left the South to go north for Chess Records. There was a time when music in the south slowed a bit in the fifties until a guy by the name of Elvis, recorded a song out Memphis, the Sun Label with Sam Phelps. This would be good until 64 when the Beatles, came and started the British invasion. Then the book picks up with another label out of the South in Memphis, named Stax Records. They would have many hits throughout the 60s and into the early 70s. By the late 60’s is when you started getting the influence of Southern Rock. First with Creedence Clearwater Revival, even though they started out of San Francisco they are still considered a Southern band. Then there is an entire chapter on Duane Allman, the work he did for other artists and some of the first bands he started, Allman Joys, for example. This chapter and the next two really go into the life of the Allman Bros. The records, the people who recoded with them and the famous Muscle Sholes recording studio. Duane Allman, playing on the Derek & the Dominos Layla, album is already famous, but you also find out about their Fillmore East Concert that would put the Allman Bros, on the map when Duane Allman was killed. Then the book goes into other groups Marshall Tucker BAND FROM 73, and Lynard SKynrd, Charlie Daniels Band, Elvin Bishop, ZZTOP, Atlanta Rhythm Section, Molly Hachet, and 38 Specal. These are just to name a few the book goes into detail with every band about records and the people in the band and the last chapters are about the new artists are coming out onto the scene. I thought this book to be everything it said it would be and more. a fantastic book. I got this book from net galley.